2018 saw the highest number of reported measles cases since 2014. According to the Centers for Disease Control and Prevention (CDC), 349 individual cases of measles were confirmed in 26 states and the District of Columbia as of December 29, 2018. The measles outbreak was the highest number of reported cases since 2014, which saw 667 reported cases. Measles. Close-up view of erythematous macules coalescing into plaques. The 2018 Childhood and Adolescent Immunization Schedule, which was released in the March 2018 issue of Pediatrics, sought to combat the measles outbreak. According to the immunization schedule, the routine measles, mumps, and rubella (MMR) vaccination is a 2-dose series at 12-15 months and 4-6 years. The newly revised chapter on measles in Rudolph's Pediatrics, 23rd edition delves into both how to treat the infection and how to prevent it. According to the chapter, "Except for general supportive measures, such as hydration and antipyretics, there is no specific antiviral therapy for persons with uncomplicated measles. Secondary bacterial infections are a major cause of morbidity and mortality following measles, and effective case management involves prompt treatment with antibiotics. Antibiotics are indicated for children with measles who have clinical evidence of bacterial infection, including pneumonia and otitis media." The aforementioned chapter further reveals that the proportions of children who develop protective levels of antibody after measles vaccination are approximately 85% at 9 months of age and 95% at 12 months of age. The true cause of a measles outbreak is complex, but can occur for a number of reasons. The CDC reports that in a given year, more measles can occur due to an increase in the number of travelers who get measles abroad and bring it into the U.S., as well as due to a further spread of measles in U.S. communities with pockets of unvaccinated people. 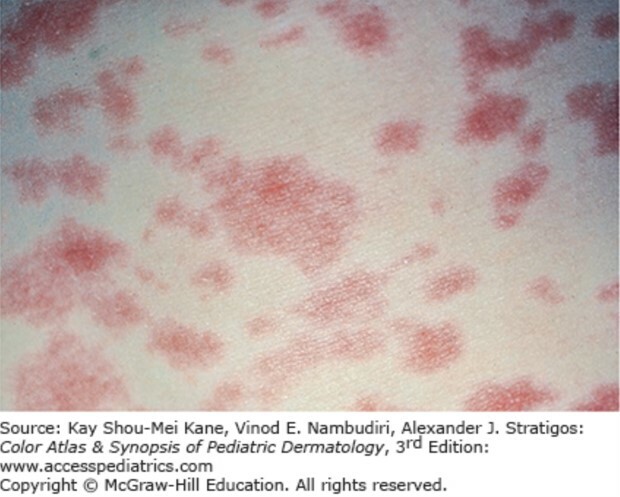 Measles picture: Kane K, Nambudiri VE, Stratigos AJ. Color Atlas & Synopsis of Pediatric Dermatology, 3e; 2016. Chapter 311 Measles: Mathew R, Maldonado YA. Measles. In: Kline MW. eds. Rudolph's Pediatrics, 23eNew York, NY: McGraw-Hill; . http://accesspediatrics.mhmedical.com/content.aspx?bookid=2126§ionid=180469395. Accessed January 16, 2019.